Upload the following sketch. The sketch now waits until pin D4 goes HIGH before starting the software serial and making a connection to the HC-05. 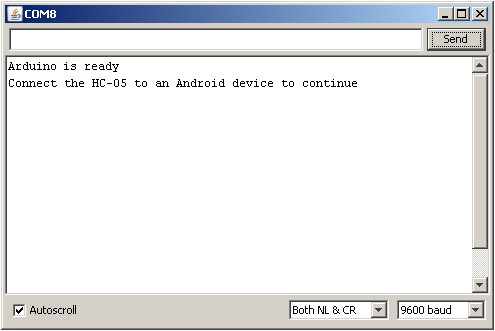 This sketch does not copy what you enter in the serial monitor input field to the serial monitor main window. // The HC-05 defaults to communication mode when first powered on. 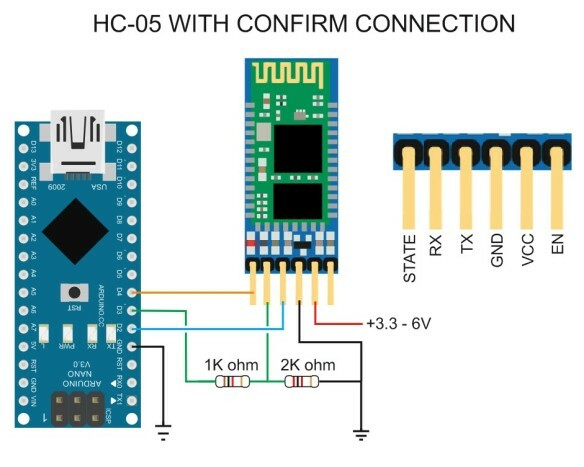 // Connect the HC-05 STATE pin to Arduino pin 4. This entry was posted in Arduino, Bluetooth and tagged fs-040, HC-05 by Martyn. Bookmark the permalink. 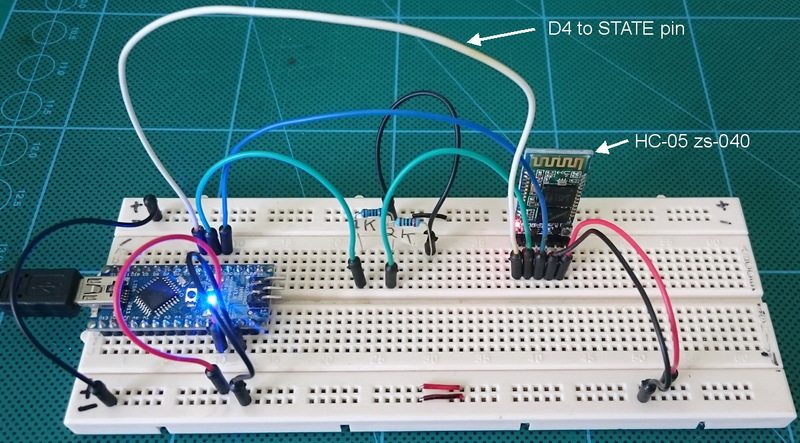 You added wire from BT state pin to arduino pin 4. I’m beginner with arduino. I want to use a blue LED but I don’t witch resistor to choose for a blue led, and I don’t how to connect the led (+ to BT module and – to arduino or reverse). First, not all modules are the same. Confirm that the one you have actually sets the STATE pin. When connected the STATE pin goes HIGH to 3.3v so the pin is providing the power. To the pin connect the LED and a resistor and then to GND. You can calculate the value of the resistor with Ohm’s law. Or use a resistor around 220ohm or 330ohm. The longer pin on the LED goes to the STATE pin. The longer pin is almost always the + or Anode. 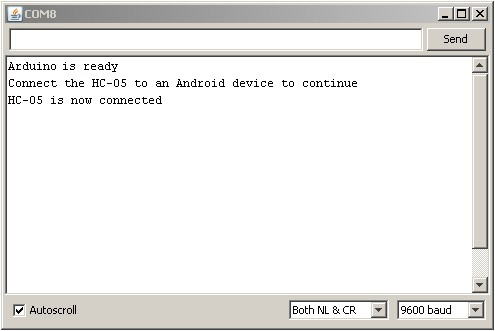 I am trying to determine how to detect that an HC-05 has gone into AT Command Mode from within my code. If I connect State to a pin and read that pin, I am only determining that the module is paired with another module. Correct? If I read the Enable pin, will that tell me whether the module is in AT Command Mode or not? Haven’t been able to find clear documentation on this. On most modules, pulling pin34 HIGH will put the module in to command mode. If done after power on, the baud rate is what ever the user has set it to. So if you control vcc to pin34 you can control going into command mode. You can also add a command check, use AT and check for the OK reply. Note, some modules have a bug in the firmware. Although bringing pin34 HIGH after power on puts the module in to command mode some commands my not work. To get around this. remove power, bring 34 HIGH, connect power. This will put the module in to command mode at 38400bps.